string(198) "d'amore e d'anarchia, ovvero 'stamattina alle 10 in via dei Fiori nella nota casa di tolleranza...'d'amore e d'anarchia, ovvero 'stamattina alle 10 in via dei Fiori nella nota casa di tolleranza...'"
Plot: The film begins with Tunin (Giancarlo Giannini) learning that his friend, an anarchist who was plotting to kill Benito Mussolini, has been killed by Mussolini's fascist police in the countryside. Tunin decides to take up the cause his friend died for. 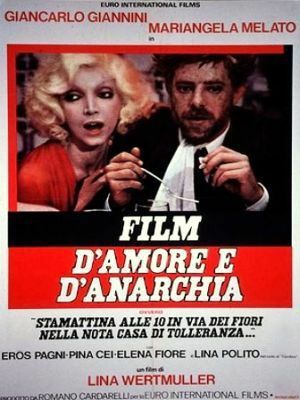 The movie then shows Tunin entering a brothel in Rome and meeting Salomè (Mariangela Melato). The two have a casual sexual encounter. Salomè explains her reasons for helping in the assassination plot as her former lover was wrongfully beaten to death by Mussolini's police in Milan. The story continues as Salomè arranges for her, Tunin and Tripolina (Lina Polito), another prostitute at the brothel, to spend the day with Spatoletti, the head of Mussolini's police. The four of them go to the countryside near Rome where the assassination will take place in a few days' time. Salomè keeps Spatoletti busy while Tunin scouts out the area and makes a plan. Tunin takes an interest, however, in Tripolina and they fall in love. Tunin convinces Tripolina to spend the next two days with him before the assassination as he fears they may be his last. On the morning of the assassination, Tripolina is supposed to wake Tunin early. She loves him and is scared he will die so she decides she will not wake him. Tripolina and Salomè argue about this and what to do but in the end they decide to let him sleep. Tunin wakes up and is furious at both of them. He goes into a tirade that draws the attention of the police. He starts a shootout with them and screams that he wants to kill Mussolini. He is captured and beaten to death by the police. The film ends the way it began showing the full title of the film "Stamattina alle 10, in via dei Fiori, nella nota casa di tolleranza..." This morning at 10, on Via dei Fiori (Flowers Street), in a noted brothel which is the headline of an unnamed newspaper. The article, displaying fascist censorship, goes on to say that Tunin (who is unnamed) was arrested and then committed suicide.